A couple of days ago, we’d posted some estimates of how many trees Glen Canyon might lose over the next couple of years. It’s a large number and a vague one. We think the number is upwards of 400 trees. How many majestic trees are going to be removed from Glen Canyon Park, and Why? 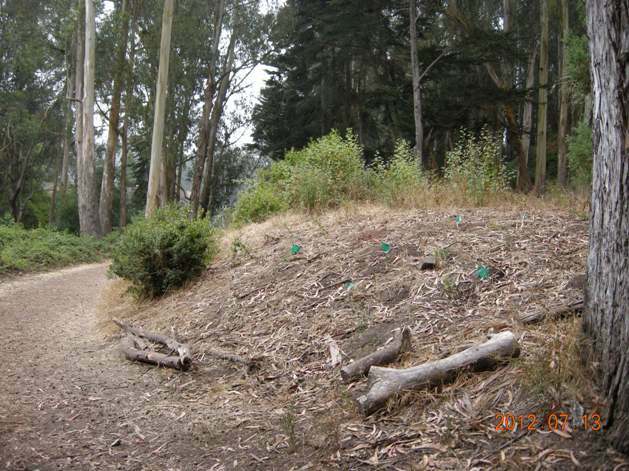 The San Francisco Forest Alliance is attending the August 16, 2012 Park Commissioners meeting about the Glen Canyon Park capital projects – we are concerned they are moving forward with the unnecessary removal of healthy trees. THURSDAY, AUGUST 16, 2012, 10:00 A.M.
Rec & Park is set to hire a contractor to begin the relocation of tennis courts and renovation of the playground, ball park and rec center. We have repeatedly asked, what trees are being removed and why? Since Rec & Park inventories every single tree, we want to know specifically how many trees are being destroyed for other reasons than they are hazardous, dead or dying, specifically interfering with the Recreation Center Capital Construction Project scope. We encourage those who can join us at the meeting to advocate your support against unnecessary, unjustified and costly tree removals. Over the past year, Rec & Park and their consultant have given numerous public presentations about the “hazardous” tree assessment funded by the 2008 Parks Bond (which we support). But the numbers keep shifting, the excuses keep proliferating and the reports keep multiplying with inconsistent assessments. This makes it very frustrating trying to get a holistic view of all tree removals, whether they are for the Natural Areas Programs that wants to replace trees with native grasses and shrubs or whether they are for actual safety problems. In reality, almost none of the trees slated for removal in Glen Canyon has been evaluated as hazardous. In fact, money is being wasted on healthy trees that pose no threat and most people enjoy their sheer size and beauty. 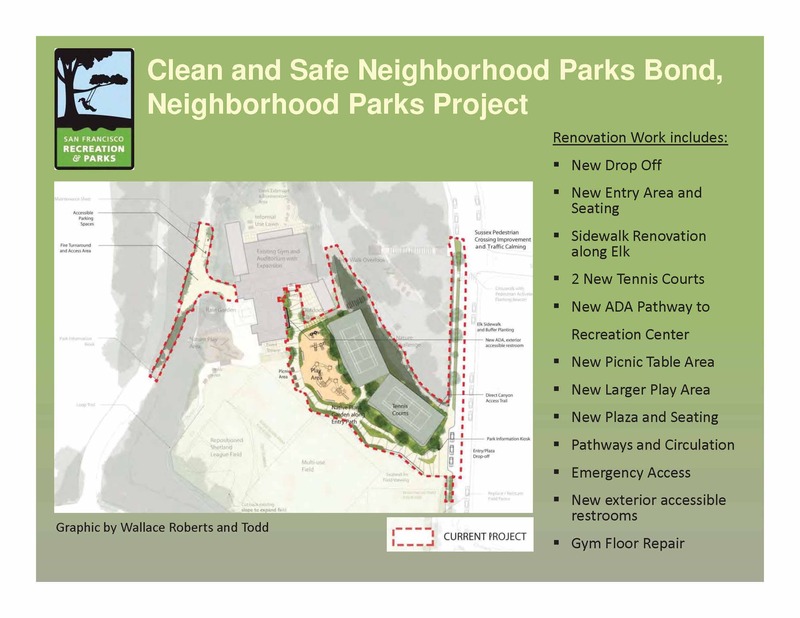 For example, we recently discovered that the Rec Center Capital Project bid packet includes specifications to remove almost all trees around and behind the Rec Center, even though most have nothing to do with relocating the tennis courts. In this picture, all the trees visible behind the tennis courts up the hillside toward Elk Street will be cut down. Is “poor suitability” a new standard that appeared from thin air? This was never defined or discussed in the Glen Canyon Recreation community meetings or other public meetings. 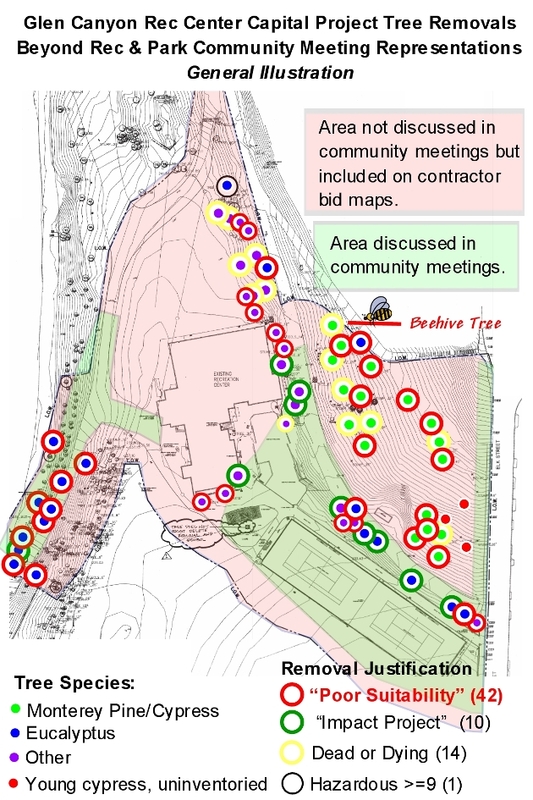 In addition, the area for tree cutting included in the contractor bid is much larger than discussed in the community meetings. In fact, the final presentation on the Rec Center capital project clearly does not show such extensive tree removal (see above). 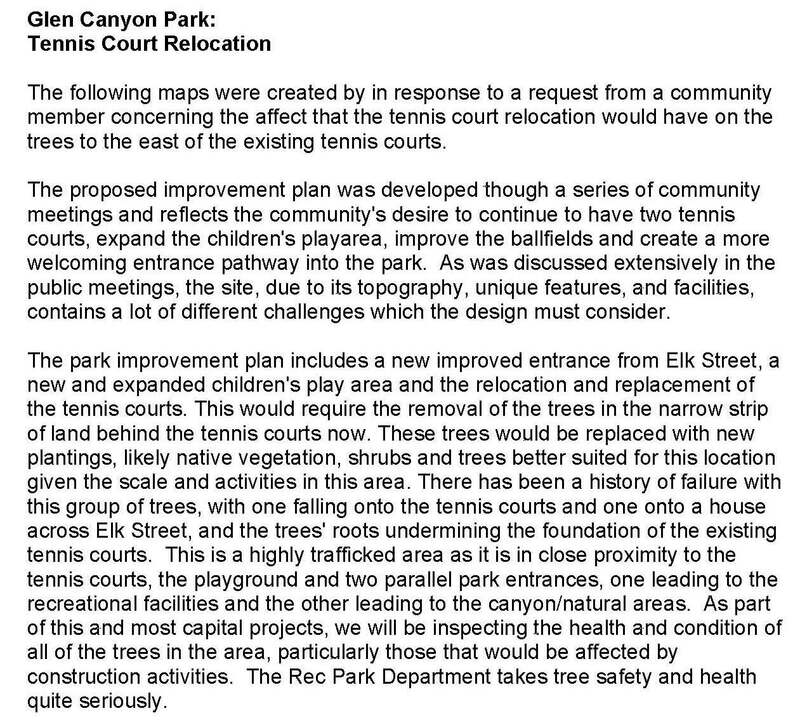 Also, the Tennis Court Relocation Diagram that was produced to specifically to address community concerns regarding trees doesn’t indicate any plans to remove trees because of “poor suitability” or to remove trees from the hillside slope or meadow. The only trees identified for removal are the cluster behind the tennis court – outlined in white on the picture below. 227 (36%) of 627 trees evaluated in the Capital Projects/Forestry assessment project. “Poor Suitability” was the arborist’s only justification for removing 176 (77%) of these trees. “Invasive” (aka non-native tree) is likely a significant factor in the criteria that the arborist used to determine the “poor suitability” designation. Rec & Park continues to present the tree removals as “hazardous” in meetings when in fact it’s the “non-native species” criteria driving tree removals for this project. This Rec Center project illustration is our attempt to consolidate the various documents to show how many trees are actually being removed and the reasons why, which have very little to do with safety. That’s a total of 404++ trees! In addition, there are reports of trees cut before 2012 (including evidence such as stumps) of around a 100 trees. Quite sadly, a pine tree that will be cut down is home to one of the two natural bee hives in Glen Canyon. (This would be in addition to one inadvertently destroyed last year.) Much of the wildlife in the canyon uses or benefits from the tall, majestic trees. Glen Canyon does not have a significant number of conifers for kinds of birds and insects and other wildlife that need conifers. Even the lovely, gnarly acacia’s that provide a screen beneath the towering Eucalyptus along the Rec Center will be gone. Acacia is also an extremely valuable habitat tree. SF native plant gardens certainly have value but Rec & Park has not proven that they can create and sustain native plant gardens outside of wetland areas. It is time to stop ripping out healthy and self-sustaining landscaping and instead start spending time caring for and maintaining what we are fortunate to have with majestic, healthy trees in our urban open space areas. 1) Join us at the Parks Commission meeting mentioned above. 2) Write or email the Parks Commission through the Secretary to Park Commissioners, Margaret McArthur. The Commissioners: Mark Buell, President; Tom Harrison, Vice President; Paige Arata; Gloria Bonilla; David E. Lee; Meagan Levitan; Larry Martin. 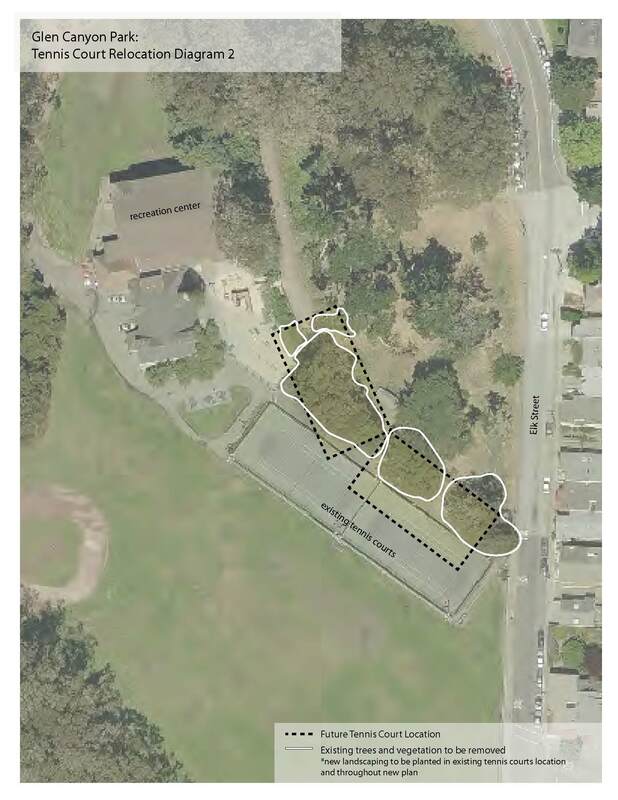 I went to the last commission meeting armed with a diagram proposing to leave the 9 large eucalyptus trees alone–and simply to move the tennis courts uphill about 14 feet into the space now occupied by an ugly entry walk. I spoke to the group and left the diagram with the Chair, Mr. Buell. At that time the Commission thought my proposal worth delaying until the Aug 14 meeting. Ammunition: No eucalyptus fell on the street–it was a diseased Monterey cypress (other sick trees have been removed). No tree fell on the tennis courts–only a large branch. Webmaster: Thank you for attending the Commission meeting and for speaking up to save our trees. There’s no two ways about it: eucalyptus trees are exotic invasive weeds which completely decimate practically EVERY living plant below their canopy and within their down-wind vicinity. About the only exception are the few varieties of South American Ivy–which in and of itself is also an exotic species and invasive weed. Together, these two invasive weed species have wiped out nearly 90% of the native vegetation and their attendant native insect and animal populations from historic Glen Canyon. Go ahead and take a look for yourself the next time you visit a eucalyptus grove: you’ll find not a SINGLE living plant below the canopy, except sometimes that exotic, invasive South American Ivy. And in the springtime, you may find some very short-lived European grasses whose seeds happened to have blown in the previous autumn–but even these grasses die out very shortly after sprouting. The oils excreted by the leaves of eucalyptus trees are a VERY effective herbicide! In essence, every eucalyptus tree is armed with its own built-in Monsanto “Round-Up™” herbicide, killing practically every plant around it, while at the same time, dispersing hundreds of thousands of seeds to quickly spread the grove. There is no reason to preserve these invasive weeds in Glen Canyon, just because a small group of people like the look of tall, “majestic” trees. Tall trees were never part of the natural flora within historic Glen Canyon anyway, prior to the arrival of Europeans in what we now call “California.” Rather, low-rise plants and bushes spread across our canyons, rolling hills and local sand dunes. A day hike around Montara Mountain just south of San Francisco will give you a very good feel of how the plant landscape looked within San Francisco and Glen Canyon prior to the European’s arrival (of course, you’ll have to ignore the relatively small groves of exotic and invasive Eucalyptus trees and Argentine Pampas Grasses—both which stick out like haunting sore thumbs in the landscape there). Webmaster: Yes, the native landscape of the San Francisco Bay Area is grassland, dune scrub, and sand dunes and a great deal of it remains, as you say. We don’t begrudge your preference for this landscape and we would appreciate it if you would give us the same liberty to enjoy the urban forest. For the sake of our local natural plant, insect and animal ecology, EVERY SINGLE eucalyptus tree and every vine of South American Ivy must be removed from our very limited “natural” parklands, including within Glen Canyon. Webmaster: Actually, there are just as many animals, including insects who are dependent upon the non-native vegetation to which they have adapted over the past 200 years. They will not benefit from the destruction of the existing landscape. If these exotic and invasive plants are now left to their own devices, our descendants eventually will only be able to view just Eucalyptus trees and South American Ivy in Glen Canyon Park! There’s no mistake about this fact! Webmaster: Your dire prediction is not consistent with scientific studies which consistently report that there is greater biodiversity now than prior to the globalization of ecology. Here’s a study that reports that only 3% of the 714 native plant species which existed when San Francisco was founded in 1850 are no longer found in San Francisco: http://milliontrees.me/2011/07/27/evolution-didnt-stop-in-1492/. San Francisco’s flora is much richer than it was in 1769.